Welcome to the blog tour for Jane, Unlimited, which is officially available TODAY! 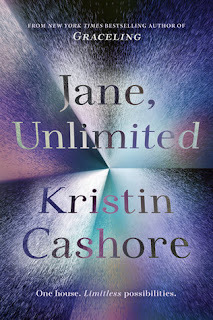 This is Kristin Cashore's latest novel. You all probably know how much of a Cashore fan I am, so this book/author needs no further introductions. 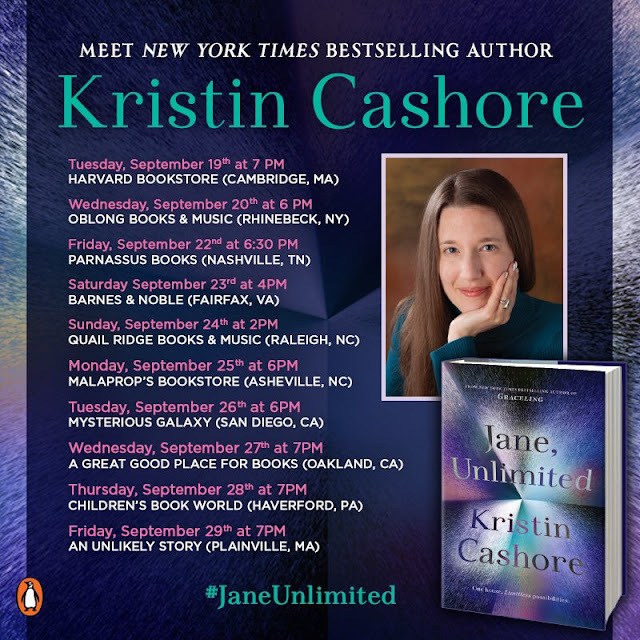 I'll be sharing information about the book, and my Jane, Unlimited-inspired mood board! Kristin Cashore grew up in the northeast Pennsylvania countryside as the second of four daughters. She received a bachelor's degree from Williams College and a master's from the Center for the Study of Children's Literature at Simmons College, and she has worked as a dog runner, a packer in a candy factory, an editorial assistant, a legal assistant, and a freelance writer. She has lived in many places (including Sydney, New York City, Boston, London, Austin, and Jacksonville, Florida), and she currently lives in the Boston area. Her epic fantasy novels set in the Graceling Realm--Graceling, Fire, and Bitterblue--have won many awards and much high praise, including picks as ALA Best Books for Young Adults, School Library Journal Best Book of the Year, Booklist Editors Choice, and Publishers Weekly Best Book of the Year. In addition, Graceling was shortlisted for the William C. Morris Debut Award and Fire is an Amelia Elizabeth Walden Book Award Winner. Want to see my Cashore collection? Enter for a chance to be one (1) of three (3) winners to receive a hardcover copy of Jane, Unlimited by Kristin Cashore. (ARV: $18.99 each). NO PURCHASE NECESSARY. Enter between 12:00 AM Eastern Time on September 11, 2017 and 12:00 AM on October 9, 2017. Open to residents of the fifty United States and the District of Columbia who are 13 and older. Winners will be selected at random on or about October 11, 2017. Odds of winning depend on number of eligible entries received. Void where prohibited or restricted by law. Thanks for sharing your mood board! The pictures you choose to include are so pretty - I especially love the dresses. I'm really hoping I'll be able to make it to Kristin's PA signing...I don't know if I'll be able to swing it with grad school but I'm trying my hardest. I love the mood board! And I love your collection! I hope you didn't have to pose too long, those books look heavy, lol. Awesome mood board! Those dresses are perfection! Woah, that's one big collection! I love it! I'm really enjoying your mood board - especially all those umbrellas. Love the graphic. The umbrella with the blue/pink flower is actually on my Xmas wishlist. That Cashore collection is seriously amazing! The Graceling Realm series is one of my favorites of all time! What an amazing collection! It looks like my Bardugo one haha. Great post, love the moodboard! I love purple! The dresses are stunning and I'd love to wear them myself. This moodboard is so enjoyable to see. It's raining here today so I'd love to have one of those gorgeous umbrellas too. Love the collection, I cannot wait to read this one. I love your mood board! Great post!! I can't wait to read this one the cover is so pretty too!! Oh, your mood board is so so pretty Alyssa :D Thank you for sharing. <3 All the hugs. I'm waiting to read this one until my hardcovers arrive, haha :D Still nervous.. yet so excited :) And ugh. I wish they invited international people for tours like this too :\ Aw. I'm so excited to read Jane, Unlimited. Love the mood board, and your Cashore collection is really impressive. Love your mood board and your massive Cashore collection! This book sounds really cool. Thanks for hosting. Ahhhh I'm so excited to read this one! Your mood board has me even more hyped about it than I already was -- there's something really epic about all those dresses. I have high hopes for Jane, Unlimited! I love your mood board for this book! I'm super excited to read it and now I'm looking forward to it even more!